Welcome to my web site. I am an engineer and watch collector named David Boettcher - but please don't worry about my family name, just call me David. I became interested in vintage watches in 2004 when I inherited my grandfather's and grandmother's Rolex wristwatches, shown in the picture here. 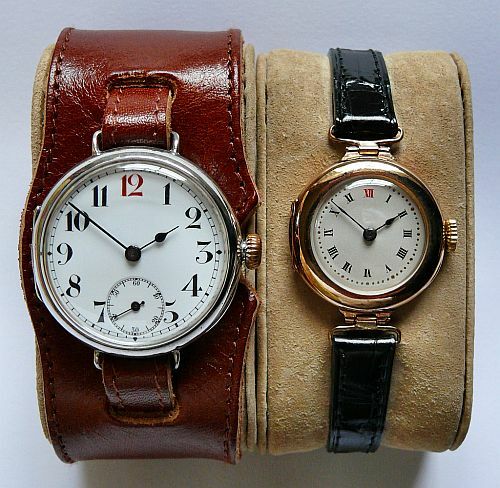 These were manufactured during the Great War (World War One, WW1, 1914 &dash; 1918) and my grandfather's wristwatch has the narrow fixed wire lugs that were typically used on men's wristwatches at the time. I wanted to be able to wear my grandfather's wristwatch but I found at the time that it was impossible to get a strap to fit the fixed wire lugs, so after a lot of fruitless searching I eventually had one made. I had to pay for the tooling needed to make the design I wanted, which would have made a single strap very expensive, and I realised that there were probably other watch collectors in the same position, wanting a strap to fit an early wristwatch from the Great War era with fixed wire lugs, but not able to find a suitable one. So I had a few extra made for fellow collectors of vintage wristwatches, and I started this web site to let people know about my straps. To me, "vintage" wristwatches means ones around 100 years old. This web site has grown as I have discovered more about the history of the earliest wristwatches and become fascinated by their development and manufacture, and the way they were worn and used. I now have a significant watch collection, I have learnt to service and repair my own watches, and I have written articles about early wristwatches that have been published in the NAWCC Bulletin and the BHI Horological Journal. To increase the authenticity of my replica Great War era watch straps for watches with silver and gold cases, I decided to make replicas of original buckles made around 1914 to 1918. I am now a registered goldsmith and silversmith with my own sponsor's mark entered at the London Assay Office, so that I can have my gold and silver buckles authentically hallmarked. You can find details of these buckles, authentic replicas of ones made over a hundred years ago in nine carat gold and sterling silver, at Sterling Silver and Gold Buckles. If you explore this web site using the blue navigation bar above you will discover pages that talk about the history and technology of watches including the development of the man's wristwatch, the waterproof watch, Borgel watches and the history of the company of François Borgel, Rolex watches, including my grandparent's Rolex wristwatches and the waterproof Rolex Oyster, pages about hallmarks found in watch cases, the potential dangers of luminous paint, and lots of other information about early watches and their makers. The web site has grown so much that it is sometimes not easy to find things, so now it can be searched using a Google Custom Search, this is also available under the "Contact Me" navigation heading. My interest in these vintage watches began when I inherited my grandfather's wristwatch as I mentioned above. Although I had known this watch all my life, I didn't realise until I inherited it that it was a Rolex, dated 1918 in silver, and my grandmother's watch that my mother used to wear was a matching 1917 gold Rolex. My grandfather was an industrial chemist in Leicester supplying the leather industry, particularly the boot and shoe industry which was strong in Leicester at the time. I know that they married in 1917 and I believe that my grandfather bought these wristwatches as a pair in 1918 to celebrate their first wedding anniversary. When I inherited the watches they were fitted with the wrong straps, and neither of them ran. After an overhaul by a Rolex licensed watchmaker they both worked perfectly. The next problem was to find suitable straps. The lady's watch was easily fitted with a new strap, but the man's watch was a different matter. Why should this be? Very early wristwatches are often referred to as "officer's" or "trench" watches because they became popular during the Great War, the first world war or WW1, when they were convenient to wear in the trenches, but were expensive and generally only officers could afford them. They are also sometimes referred to as "fixed lug" or "fixed wire lug" watches, because of the method of holding the case to the wrist where fixed loops of wire, called lugs, were soldered onto the case to loop a thin wrist strap or band of leather through. These narrow lugs present a problem to the collector of these interesting early wristwatches. After cleaning and servicing, watches that are now around a hundred years old go just as well now as when they were new, and they cry out to be worn. However, modern wristwatch straps and bands do not fit the fixed wire lugs, and a 35mm diameter wristwatch on a 10mm wide lady's wrist strap not only looks ridiculous, it is also uncomfortable to wear. After some research I discovered that men's watches of this era were often fitted with cuff type straps having a wider back piece behind the narrow strap. This looks a lot better, is more comfortable to wear, and also holds the watch in place. However, after consulting all the jewellers I could think of, and scouring the internet for months, I found just two that came anywhere near what I wanted, but one was badly designed and very expensive and the other was poor quality. After all this effort and still not able to wear my grandfather's watch, I resolved that I would have to have a cuff type strap made to my own design and specification. This involved getting made a new press knife, which is used like a pastry cutter to cut out the leather pieces under a hydraulic press. There really is no other way to get a neat finish to the cut surface because leather is such a tough material. These press knives are not cheap and making just one strap would have made it very expensive, so I had a few extra made that I could sell to offset the tooling costs, and so that fellow enthusiasts could enjoy wearing their own vintage watches. I sold these first few straps successfully, and then I was asked for more, and also for a different design, so I had some more made, and another press knife so that I had two different designs to offer, and this has continued in a small but regular way since then. It gives me great pleasure to know that a vintage watch, one that perhaps saw service during the first World War, or belonged to somebody's grandfather like mine, can be worn and enjoyed today, looking good on a properly designed and made strap. One of the most touching comments I have received from a customer who was visiting the First World War battlefields in France, and he remarked that with the strap I had supplied I will be able to wear my grandfather's watch at the very spot where he went 'over the top' on the Somme in 1916. A sobering reminder of the historical events and individual human experiences and tragedies which many of these watches have witnessed. If you have a watch like this, remember that it is a piece of history and please take good care of it. You might even use it as the focus of a family history project and document the history of your ancestor to pass on to future generations. To further improve the authenticity of my replica Great War straps I am now offering them with hand made solid sterling silver (.925) and 9 cart gold reproduction buckles. Silver and gold are beautiful materials that takes a lustrous high polish. If your watch has a gold or silver case, a strap with a base metal buckle doesn't do it justice, you really need one of my straps with a sterling silver or gold buckle buckle, and one of my polishing cloths too! My hand made buckles are copies of authentic period buckles and are hallmarked by the London Assay Office with a full set of punched traditional English hallmarks including the leopards head and the walking lion, just like the originals were marked nearly 100 years ago. 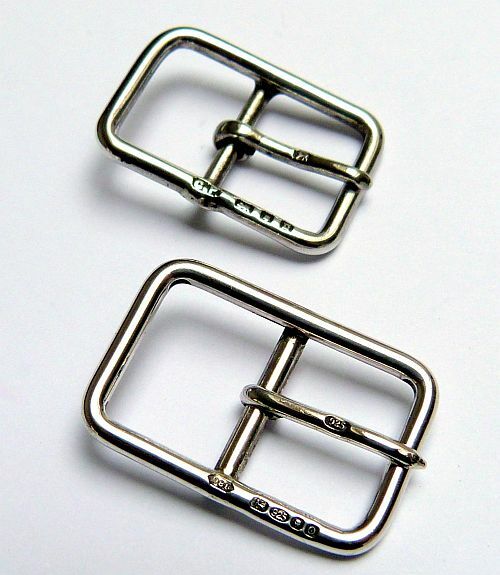 Full details of the sterling silver and gold buckles and silver polishing cloths are on the Period Replica Buckles page. I am a Fellow of the British Horological Institute (BHI). Formed in 1858 to promote horology, the BHI today continues to provide education, standards and support to its members around the world involved in making, repairing and servicing clocks and watches. Although primarily an organisation for professionals in the watch and clock trade, associate membership is open to non-professionals and brings the monthly Horological Journal and access to resources such as the extensive library, courses and teaching facilities. I am a member of the British Antiquarian Horological Society (AHS). The AHS is a learned society formed in 1953 to promote the study of clocks and watches and the history of time measurement in all its forms. In order to achieve its aims the AHS holds meetings and publishes a quarterly journal Antiquarian Horology and various books. It is not really a society for watch collectors, but it does publish interesting research on early clock, and sometimes watch, technology and design. I am a member of the American National Association of Watch and Clock Collectors (NAWCC) . Although the NAWCC is primarily about American clocks and watches it is not exclusively so, and there are a lot of resources and information on their web site, plus very useful message board forums that are open to non-members to ask questions. Every two months the NAWCC publishes "The Watch & Clock Bulletin", which sometimes has an interesting article about watches.